Easy Installation. Suitable for any space. Already have a home HVAC system? Get scheduled maintenance and repairs from a trusted provider with 30 years experience. Speak with a Mistubishi-certified technician. We'll help you install the perfect, energy-efficient heating/cooling system for your home. Are you looking for an energy-efficient heating and cooling system for your home or business? 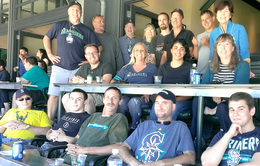 A Mitsubishi ductless heat pump is the most efficient Seattle HVAC solution. Let’s say you’d like to have air conditioning but your home or new room lacks the necessary ductwork. Or maybe you have a room that’s a little too hot or too cold and you’d like to make it more comfortable. 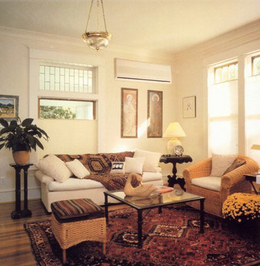 Ductless systems offer an elegant solution. Going ductless doesn’t involve going through a major renovation. In fact, there’s very little mess at all. Mounted high up on the wall, where it’s least obtrusive—and most effective at quietly and gently directing treated air to every corner of the room, a ductless heat pump or air conditioner integrates neatly into your space. What is a “split” or ductless mini-split? These are other names for ductless heat pump. If you are looking to cool one room as opposed to a whole house, a ductless split type system is a good solution. A ductless split system has several advantages over a traditional window unit. First and foremost a thermostat that can keep the room at a constant, comfortable temperature instead of blasting on and off. In addition, you don't have to move a ductless heat pump system in and out of the window as the seasons change, and you don't have the open-window security concerns of a moveable unit. Why choose a Mitsubishi ductless heat pump HVAC system? The Mitsubishi ductless split systems are the most energy-efficient systems available. Energy efficient systems that save you money. Mitsubishi systems are dramatically more efficient than traditional HVAC systems. These systems automatically adjust to changing conditions to deliver ideal comfort while only using the energy that is needed. No more. No less. Why pay to cool or heat your home all year long when you only live in a few rooms at a time? With a Mitsubishi ductless heat pump system, you can actively condition the rooms you live in; the other rooms simply turn off or setback. Zoning your home to how you live allows you to save energy while maximizing your personal comfort.